WordPress trackback spam is one of the major problems for WordPress site owners, if you are facing this particular issue then it can sometimes become very frustrating and you should definitely do something about it. If your methods of spam control are failing to prevent trackback spam then the methods below will surely resolve your issues. Spammers generally use automated scripts sending millions of trackbacks to websites around the world. A comment spam is an example of trackback spams as they are not directed the site itself directly. Trackbacks are sometimes ignored by websites. Spammers use this fact to their advantage and leave their links on such websites. Mostly, these links direct to some sort of illegal activity i.e. adult websites, the sale of drugs, running scams etc. • Open Settings and then open the Discussion page. • Scroll down to the default article settings. • Uncheck the box next to ‘Allow link notifications from other blogs (pingbacks and trackbacks)’. 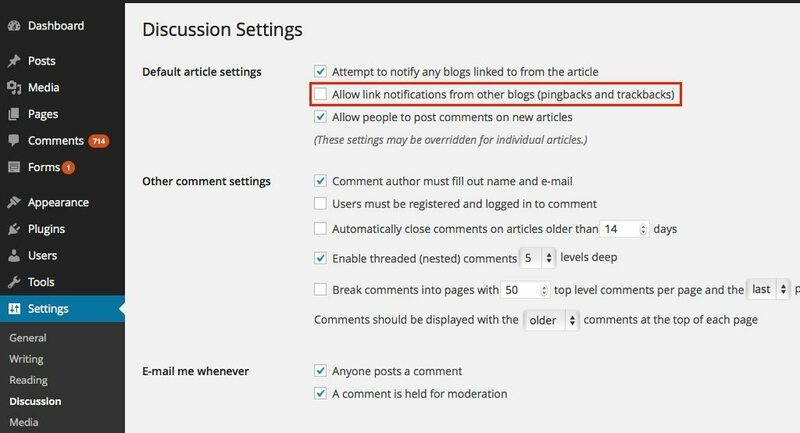 This will only turn off trackbacks on the articles you post after applying these settings. To disable them on existing posts, some advanced setting needs to be changed which is not the scope of this article. Users rarely use trackbacks because it is manual and requires extra input. Spammers use trackbacks because it is easy to cheat here. Users use pingbacks very often because they work automatically. Spammers do not use pingbacks because backlinks are checked. So trackbacks are blocked by default but pingbacks are enabled. You may enable trackbacks if you use it in [Settings] = [Anti-spam Pro] section. You may read more about the difference between trackbacks and pingbacks. Anti-spam Pro plugin blocks spam in comments. Anti-spam Pro is a powerful and extended version of free and popular Anti-spam plugin. The plugin is easy to use: just install it and it just works. Akismet is one of the plugins which come with a WordPress site. This plugin connects the website to Akismet which checks if it is a spam or not. It is a massive spam filtering site. It does not only check the spam commenting but also is effective against WordPress trackback spam. If you are not using it then you should start using it right now. Anti-spam plugin blocks spam in comments automatically, invisibly for users and for admins. This plugin efficiently checks every incoming trackback by using simple tests. It simply blocks trackback first then check if it is from the original track back source. The task of this plugin is pretty simple, it does not protect you from spam trackbacks rather it completely hides all the pingbacks and trackbacks from your site. This plugin is particularly helpful if your WordPress site is flooded with trackback spam as all the trackbacks are hidden from the visitors and you can delete them through the comments section in your WordPress admin area. Antispam Bee is a popular choice for WordPress users with over 200,000 active installs. It not only has the option to validate trackbacks, it also checks comments for spam. Blog combat spam is the strength of Antispam Bee. For years, the plugin will be trained to recognize spam comments reliable (on request to be removed immediately). Antispam Bee accesses different techniques that have been proven to identify spam messages. An extremely powerful and user-friendly WordPress anti-spam plugin that eliminates comment spam, trackback spam, contact form spam & registration spam. No CAPTCHA’s, challenge questions or other inconvenience to site visitors – it works silently in the background and simply makes WordPress spam disappear. This plugin got a simple task, that is to stop spam, hopefully, 100%. What this plugin does is modify the comment form on your website, adding a new field and renaming others. We call it a spambot trap. Very nice Arslan! You have put together a great collection of resources bloggers can use to get rid of trackback spam. Thanks for including the article from my blog!